Chiricahua-style point from Wupatki National Monument. Photo Credit: Dan Boone/Ryan Belnap, Bilby Research Center, Northern Arizona University. 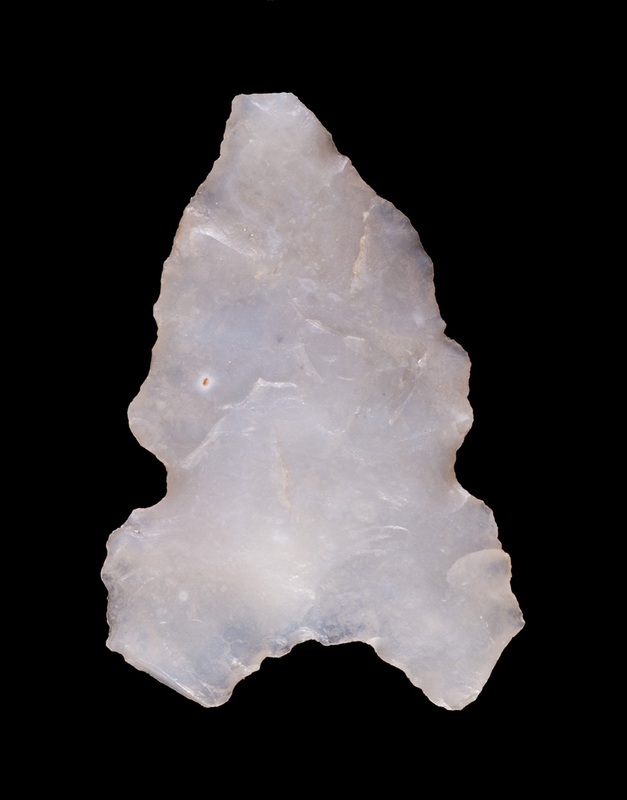 The Archaic period in the Southwest begins with the end of the Paleoindian period and ends with the adoption of agriculture in the north and the advent of pottery in the south. Dates for the Archaic are variable, with the earliest dates around 8,500 B.C. and end dates as late as the first few centuries A.D. in some places. Archaic people were descendants of the Paleoindians, but were generalists, rather than specialists, meaning they focused on a broad range of food sources, including wild game and a wide variety of plant foods, and ultimately, toward the end of the period, cultivated and domesticated plants. Archaic artifact assemblages reflect this transition in the increased presence of manos, metates, and other implements for grinding plant foods. The Archaic in the Southwest includes several subregional spatial divisions that might signify broad territories within which people interacted, shared information, and chose partners. These traditions include the San Dieguito-Pinto Tradition, marked by Gypsum and Pinto projectile points in the western portion of the Southwest; the Oshara Tradition, marked by Jay, Bajada, and San Jose style points in the north; the Cochise Tradition with Chiricahua, Cortaro, San Pedro, and Cienega style points in the south; and in the southeast, the Chihuahua Tradition, which includes points similar in style to those of the Oshara and San Dieguito-Pinto traditions. A very basic chronology for the Archaic in the Southwest is the Early (8,500 B.C. – 4,000 B.C. ), Middle (4,000 B.C. – 2,000 B.C. ), and Late (2,000 – as late as A.D. 500) scheme. Early Archaic sites are rare but present in the Southwest, including sites like Ventana Cave, Arizona, where the transition from Paleoindian to Archaic is visible in the cave strata. 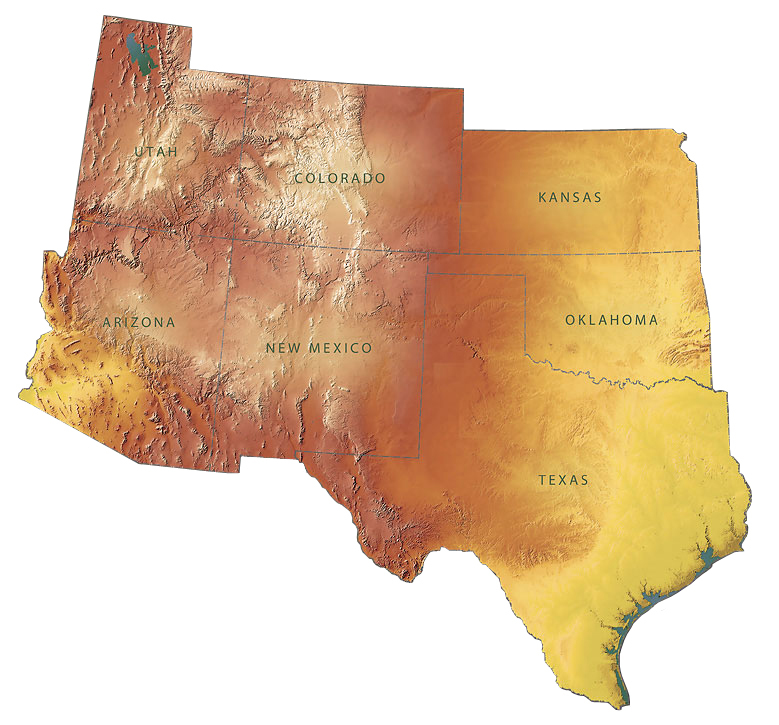 The Middle Archaic in the Southwest is underrepresented, perhaps as a result of a period of prolonged aridity. The Late Archaic, however, features a vast increase in human presence in the Southwest, with sites often containing abundant artifacts and trash deposits indicative of greater sedentism associated with an increased reliance on plant foods. The transition from the Late Archaic to Early Agricultural Period in the Southwest varies by location. On the Colorado Plateau, the earliest farmers were the Basketmakers, and in the southern deserts, agriculture began during the San Pedro phase of the Cochise culture. The earliest dates for agriculture in the Southwest have now been pushed back as early as 2,000 B.C., with irrigation systems present by 1,000 B.C. even in the north. The Early Agricultural Period was a critical threshold in the archaeology of the Southwest. Villages become larger and more widespread, indicating that agriculture was indeed a successful strategy for producing food and insuring the stability and success of communities. These successes laid the foundation for further population growth and the regional differentiation of cultural traditions that ultimately gave rise to the modern tribal divisions of the Southwest.